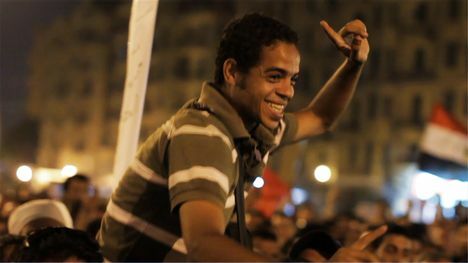 Synopsis: The Egyptian Revolution has been an ongoing rollercoaster over the past two-and-a-half years. Through the news, we only get a glimpse of the bloodiest battle, an election or a million-man march. At the beginning of July 2013, we witnessed the second president deposed within the space of three years. We spoke to director Jehane Noujaim via email about the making of her Academy Award-nominated documentary feature, The Square. Jehane Noujaim: The first version was much more focused on the historical timeline, while the second is focused primarily on the character experience within that timeline. In the end, the human story is lasting; events will come and go. The use of music and sound was also a distinction between the two versions because we had more opportunities to use sound and music to enhance the film in the second version. One of the biggest distinctions is our use of Ahmed's voice as the anchor or narrator of the second version. D: Along those lines, it's always a challenge for any vérité documentarian to gauge when it's time to transition from production to post-production. What were the key determinants for you in assessing that you had a story, even though the story was still unfolding? JN: We focused on the human story and the journey of our characters and their actions and experiences. 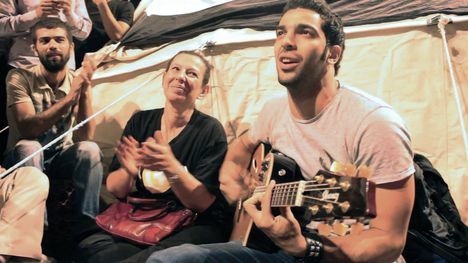 A key moment was when, less than three weeks after Mubarak resigned, we saw Ramy [one of the characters in the film] go from being hailed as a hero to being captured and tortured, and no one was reporting it. That's when we knew there were two narratives: one of what was happening on the ground vs. what was being reported. 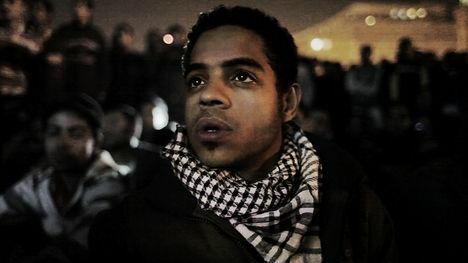 We saw that our characters had gone through an awakening after living in silence under Mubarak for several decades, they witnessed the beauty of revolution, and then saw that get taken from them by the military. It was when the characters saw that the person they elected was beginning to use the tools of democracy to create a dictatorship that they realized they were looking not just for a leader, but for a conscience. They reached a point in the arc when they realized that change does not come overnight, but from a graduated, concerted effort over time. D: Another challenge is capturing a historic event, and then making what you capture a lasting document that future generations will reference. Talk about the process in the editing room for making this happen. character moments and the plot-point moments in the historic timeline that would make sense in terms of the broader narrative. of Cards manifestation, is adding more documentaries to its docket and promoting them aggressively, while Gathr empowers movie-lovers to bring films to their neighborhoods. How are these models playing out for you? JN: They are great. We wanted to go with a platform that would be most accessible to the widest audience possible, and we have been very happy with the partnership. for the film now, and for the future? censorship, and we believe that because of the power of international witness and support, the authorities might give us permission to release it legally and broadly across Egypt. This will be a major step in the direction toward support of freedom of speech in Egypt because it will be the first time the government allows a piece of work to exist, whether or not they agree or disagree with what it says. In those moments of darkness when people are being assailed for tweets and journalism, there is no more crucial time than now to fight for those basic human rights. The Square will be screening on as part of IDA's annual DocuDay, Saturday, March 1, at 5:00 p.m. at the WGA Theater in Beverly Hills. For more information and to purchase tickets, click here.